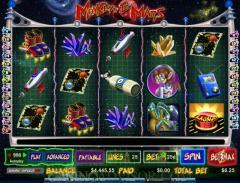 Monkeys to Mars cashes in on the popularity of the comic outer space theme. The male and female monkey astronauts are going to Mars. The reels are set in the background of distant galaxies and the symbols on the reels have associations with space travel. The symbols have a background of space consoles and the payline buttons are in the shape of rockets. The Launch Button is the wild symbol and the Alien is the scatter symbol. The other symbols are the Monkeys to Mars Logo, Male Monkey, Female Monkey, Boots, Laser Gun, Oxygen Cylinder, Map, Walkie Talkie, Brown Crystal and Purple Crystal. The Female Monkey blows hearts, the Walkie Talkie sends out a radio signal and the Oxygen Cylinder releases the gas and starts spinning. The best animation is seen in the Launch Button symbol. The Launch Button is hit and a rocket takes off across the reel leaving behind in its wake a cloud of smoke. All the symbols on the reel then act as wild symbols. The coin size does not only have a wide range from 0.01 to 20.00, but also has more than 30 stops within that range. From 1.00 to 20.00 the stops occur in increments of 1.00. 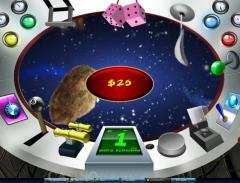 The slot game has 25 paylines and players are constrained to wager one coin per payline. The number of paylines and the coin size can be selected by operating the buttons below the reels. 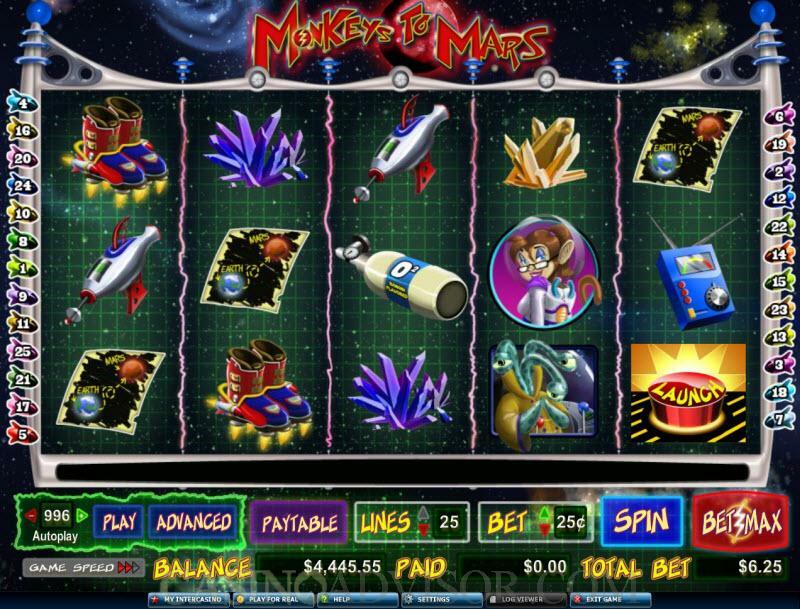 The Bet Max button automatically enables all 25 paylines at the selected coin size and sets the reels spinning. The minimum wager per spin is 0.01 credits and the maximum wager per spin is 500.00 credits. The Launch button is the wild symbol and it appears only on reels 2, 3, 4 and 5. The Alien is the scatter symbol. Neither the wild symbol nor the scatter symbol offer payouts. When three Alien symbols appear on reels 2, 3 and 4 the Asteroid Bonus Feature is triggered. In this bonus feature the player selects five weapons to fire and receives credits. Monkeys to Mars has a Rocket Re-spin Feature that is awarded randomly after any spin. Before that the payouts for the normal spin are awarded. The re-spin takes place on reels 2, 3 and 4 only. There are bulbs above these reels and when any of them light up the re-spin feature takes place. The re-spins may take place in one or two or all three reels. During the re-spin the Purple Crystal Symbols become Launch Buttons. If there are any payouts after the re-spins these are added to the player’s balance. Monkeys to Mars has a number of customization options. Players can select from three game speeds. At the fastest game speed the reels do not spin, only the symbols change. Sound can be enabled or disabled and players can play in a mid size screen or in a full screen. Interested in reading more detailed information about Monkeys to Mars? If so Click Here for more details.